Just goes to show how a simple idea can develop (as in this instance) and blossom into a world wide event. The idea of a World Bee Day came from the Slovenian Beekeeper's Association. Slovenia has the most beekeepers per capita throughout the world - every 200th person is a beekeeper! It may have taken three years of effort, both in terms of the official procedures within the UN, and the process of informing countries around the world, but that hard grind has paid off for Dejan Židan – head of the World Bee Day project and Deputy Prime Minister of the Republic of Slovenia. The United Nations have announced that World Bee Day will be held on the 20th of May each year. This date was chosen because bees are most active pollinating in the northern hemisphere (in Spring) and for the southern hemisphere, it is a time for harvesting bee products and honey in the Autumn before the hives slow down for the winter. The chosen day is also the birthday of Anton Janša (1734–1773), who was a pioneer of modern beekeeping and one of the greatest experts in his day. He was the first teacher of modern beekeeping anywhere in the world, appointed by Empress Maria Theresa as a permanent teacher at the (then) new beekeeping school in Vienna. Solovenian people take their beekeeping very seriously, in fact Slovenia is the only country in the European Union to have introduced legal protection for its bees and in 2011 it became one of the first countries in the EU to prohibit the use of certain pesticides that are harmful to bees. Indeed the indigenous Carniolan honey bee is part of Slovenian national identity. Workers - these bees are the ones seen most by us - they are females that are not sexually developed. They are smaller than the queen, their abdomens are shorter and on their hind legs they possess 'pollen baskets' - these are scoop-shaped surfaces on the bee's back legs, surrounded by stiff hairs. After a flower sprinkles a worker bee with pollen, she can groom the grains into her baskets for storage which is then toted back to the hive. The workers are aptly named as they work as a team doing many tasks - foraging for food (pollen and nectar from flowers), building and protecting the hive, cleaning and circulating air by beating their wings to release a sweet orientation scent (this helps direct other members back to the hive). They are also the undertakers of the hive by removing any bees that have died and disposing of the corpses as far from the hive as possible. Similarly, any diseased or dead brood are quickly removed before the health of the colony is threatened. The life span of the worker bee is six weeks during the colony's active season however they live longer (four to eight months) during their less active winter months. 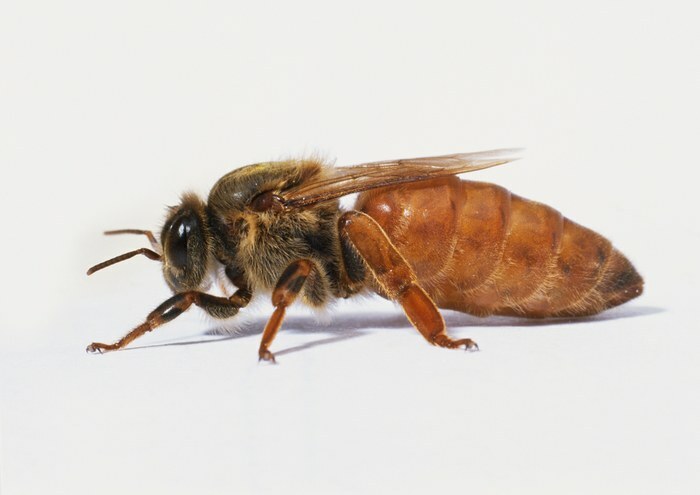 These winter workers are loaded with protein and are sometimes referred to as 'fat bees'. The Queen - is the largest bee in the colony with a long and graceful body and there is only one in each hive. She is the only female with fully developed ovaries. She has two primary functions - to produce chemical scents that help regulate the unity of the colony and to lay eggs, lots of eggs. In fact she could only be described as an egg-laying machine as she is capable of producing up to a massive 2,000 eggs a day. 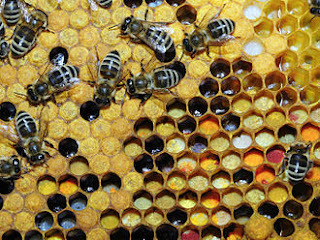 These eggs will spawn the hive's next generation of bees. If the queen dies, workers will create a new queen by feeding one of the female larvae an exclusive diet of a food called 'royal jelly'. This elixir enables the worker to develop into a fertile queen. The queen may be an egg-laying machine but she is totally incapable of tending to her own basic needs. She can neither feed nor groom herself - she can't even leave the hive to relieve herself so her doting attendants take care of her needs while she tirelessly goes from cell to cell doing what she does best - laying eggs. The queen has a stinger but it is rare for her to use it, queens basically only use their stingers to kill rival queens that may emerge or be introduced in the hive. After emerging from her queen cell, the new virgin queen will mature for a few days. Then she will leave the hive to mate in the air (nuptial flight) with male bees (drones). She can take several mating flights over the next few days. After that time, she will never leave the colony again (unless the colony swarms). Beekeepers tend to replace the queen after a couple of seasons to ensure maximum productivity, even though a queen can live for 2-3 years. As the queen ages, her egg-laying capability slows down, which results in less and less brood each season - less brood means a smaller colony. 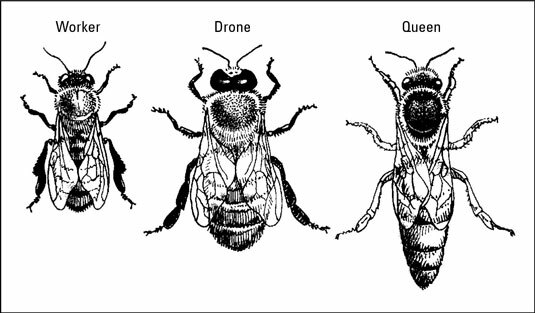 Drones - male bees are called drones, there would be several hundred in each hive during the spring and summer but make up a relatively small percentage of the total hive's population overall. These drones are turfed out for the winter months when the hive goes into a lean survival mode. 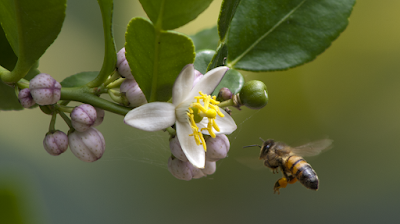 Unlike the female worker bees, drones do not have stingers and their primary role is to mate with a fertile queen. 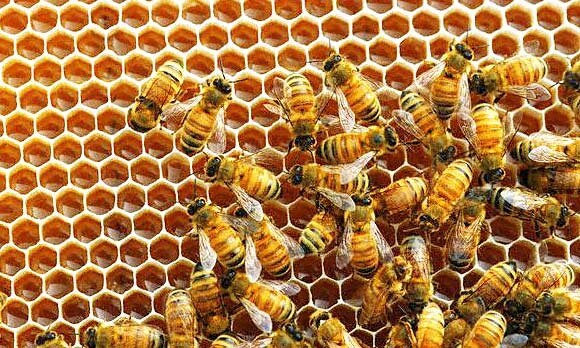 Although they are important in controlling the temperature and humidity within the hive. Research indicates that drones can produce one and half times as much heat as a worker bee, and that even those drones not directly next to the brood, are never the less assisting with heat regulation inside the nest. 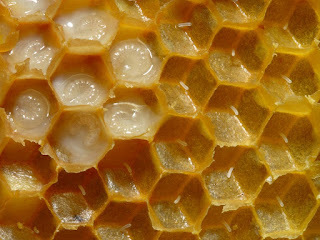 Honeybee larvae and pupae are extremely stenothermic, which means they strongly depend on accurate regulation of brood nest temperature for proper development (33–36°C). The drone's shape is different from both worker bees and the queen. His shape is in fact more like a barrel and his eyes are huge and seem to cover his entire head. 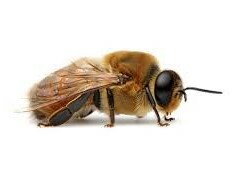 He doesn't forage for food from flowers, and he doesn't have any pollen baskets; he doesn't help with the building of comb, because he doesn't have any wax-producing glands; nor can the drone bee help defend the hive as he doesn't have a stinger.... the single purpose for this feller is to mate with the queen. The queen has an organ inside called the 'spermatheca' and is the receptacle for the sperm. The queen will mate with several drones during her nuptial flight. After mating with the queen, the drone's most personal apparatus is torn away and it falls to its death and the worker bees will remove the body - it's a tough life for a drone. Worker bees make the hives to store honey and feed themselves throughout the winter. Hives are made of six-sided tubes, which is the optimal shape for storage - less wax and has good capacity. Around the time a worker bee turns 10 days old, she develops a unique wax-producing gland inside her abdomen. The glands of worker bees convert the sugar contents of honey into wax, which oozes from their abdominal glands in tiny flakes of wax. 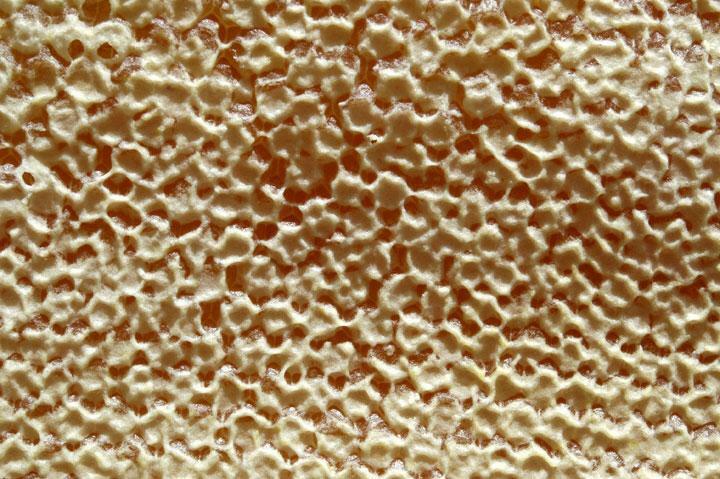 Workers chew these pieces of wax until soft and malleable, then the chewed wax, with a little added honey is used in the honeycomb construction. The internal temperature of the hive is usually around 30 to 35 degrees Celsius, the temperature necessary to control the texture of the wax. 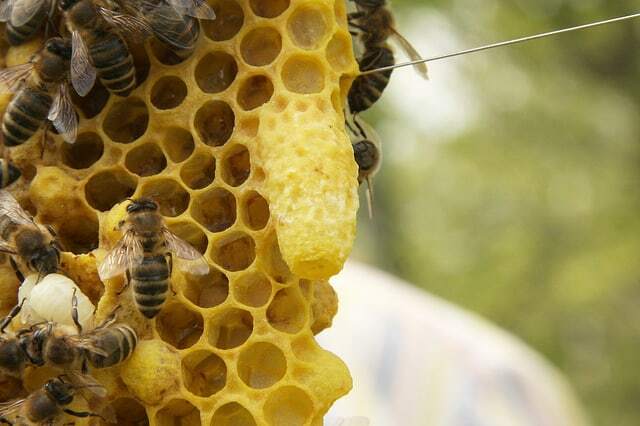 The hexagonal cells of the honeycomb are used to house larvae and other brood, as well as storing honey, nectar and pollen. 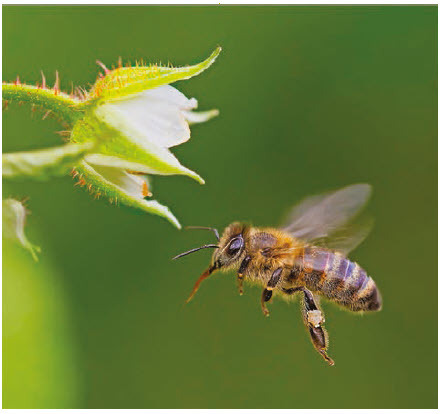 Workers forage for food and gather nectar from different flowering plants bringing them back to the hive for food. They collect nectar by drinking it - after slurping the nectar, it is stored in a kind of pre-stomach and is mixed with a specialised enzyme. 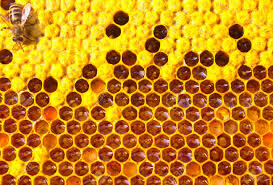 After returning to the hive, this substance is passed from one worker to the next until the water within it diminishes. At this point, the nectar becomes honey, which workers then store in the cells of the honeycomb. The main diet of honey bees is comprised of honey and pollen, they do collect other liquids and juices from plants and fruits as well. If, for instance they encounter insects that secrete honeydew they collect these liquids and store them as honey. However, when there is no pollen, nectar or honeydew available, honey bees may also collect and store plant spores and dusty animal feed as they would nectar or pollen. They have a wide range of nutritional requirements including vitamin B complex and vitamin C, minerals, lipids, proteins and carbohydrates. Honey bees need these nutrients for taking care of their young, the development of young workers and the overall survival of the colony. For instance worker bees eat beebread (a type of fermented pollen) and honey. Nurse bees mash this into a 'worker jelly' and add glandular secretions. Within three days, the eggs (right of image) will develop into larva (left of image). Worker bees initially feed the larva with royal jelly, but this ceases (unless the hive requires a new queen) after a few days. The larva is a striking 'milky' white with the distinctive curled shape developing over time. Around the time the transformation from larva to pupa takes place (at about day nine) workers will cap the cell. The colour of capped brood is darker and rougher in appearance (cells left of image). This cap is porous, which allows the larvae and eventually the pupae to breath. After a few more days the pupa reaches the state from which the adult bee will emerge from the capped cell - the timetable is different for drones and queens. The majority of cells will receive a fertilised egg from the queen, most of which will be worker bees - one egg for each cell. About 20% of the cells are dedicated to drones. These cells are larger in volume and have a darker, rougher cap which bulges out from the cell (resembling a bullet) as the drone is larger than a worker bee. Drone larvae and pupae will survive with slightly lower temperatures than workers. For this reason, drone cells are often placed at the lower edges of the frame, away from the heat formed by the cluster (see image above). Queen cells have a peanut-like appearance. There are a number of reasons why they might be created. A colony will often 'build up and tear down' queen cups, with no particular intent to fully develop a new queen. 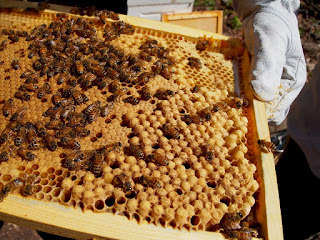 Or if the queen cups are built along the sides of the frames then the colony may be thinking of supersedure. If there is a queen cell developed with a viable potential queen enclosed the current queen may raid that cell and kill this rival. 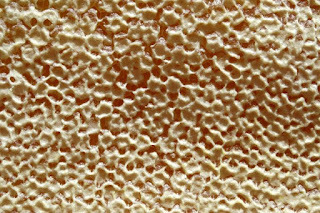 Capped honey cells are usually found at the very top of the frame, this often extends around the corners. Usually found just below the capped honey cells are open cells which contain nectar - the bees consume this and feed it to the larvae. Pollen will be different colours - it rather depends on the source of the pollen. Often there will be shades ranging from bright orange and red to almost black. 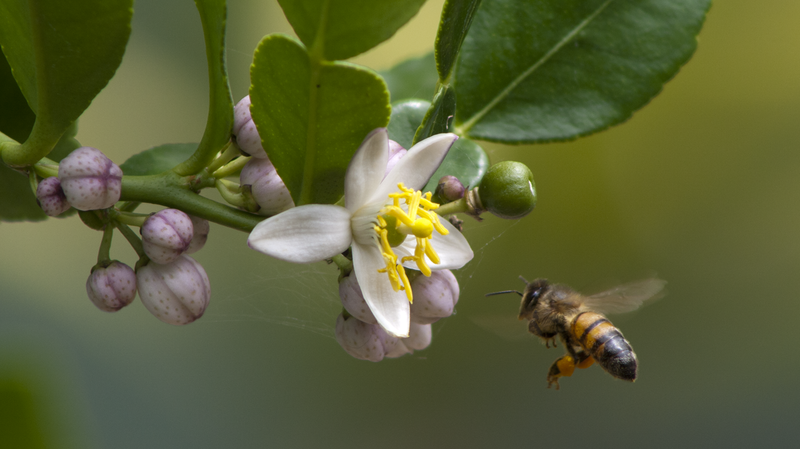 Like some insects, honey bees behave defensively when intruders are near, guarding the entrance to their nests. However, honey bees are able to sting only once because their stingers contain barbs and are attached to the worker's intestines. So when they sting their stingers detach from the body after attacking a victim and while that bee will die shortly afterwards there are pheromones secreted during the attack which will alarm and stimulate other worker bees to attack as well. 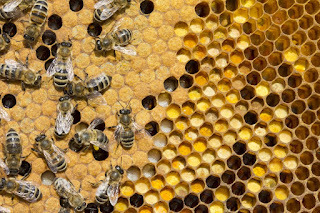 This post was written to coincide with World Bee Day, 20 May. We all need to be mindful of these very, very important pollinators and do what we can to preserve them. There is a post from 2014 about bees and the vegetable patch which imparts the importance of bees and our gardens. A great website for further information about bees and bee products can be found at Buzz About Bees. 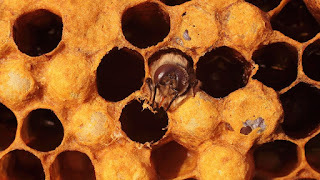 A website well worth the visit, if for no other reason than to read a very entertaining account on bees please visit Royal jelly isn't what makes a Queen bee a Queen bee.